China's President Xi Jinping attends the opening ceremony of the second World Internet Conference in Wuzhen town of Jiaxing, Zhejiang province, China, Dec. 16, 2015. Despite being the world’s biggest censor of online content, China is hosting a conference this week at a small town in eastern Zhejiang province to try to sell its views about Internet governance to the world. The list of big international companies in attendance was short, but did include the head of China Internet giant Alibaba and Taiwan’s FoxConn Technology. Representatives from Apple, IBM, Microsoft and Facebook also attended, despite calls to boycott the proceedings. 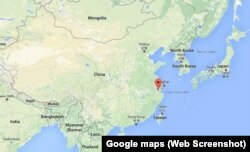 Facebook, Twitter and YouTube are among a long list of websites that are blocked in China. In addition to a keynote address from Chinese President Xi Jinping, the opening session Wednesday included speeches from Russian Prime Minister Dmitry Medvedev and Pakistani President Mamnoon Hussein. In his speech, Xi argued all countries should jointly oppose Internet surveillance and hacking, and urged countries to fight against what he called a cyber arms race. He also spoke about Internet sovereignty, a key position China uses to justify its tight controls. 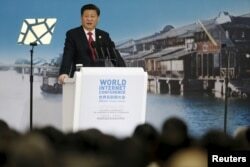 China's President Xi Jinping speaks during the opening ceremony of the 2nd annual World Internet Conference in Wuzhen town of Jiaxing, Zhejiang province, China, Dec. 16, 2015. "We should respect each others' right to choose our own Internet development paths and Internet governance models, Internet public policies and the equal right to participate in international cyber governance,” Xi said, adding that “(we should) oppose cyber hegemonism, not interfere in others' internal affairs, not participate, connive or support cyber activities that jeopardize others' national security." China has some of the world’s most sophisticated Internet controls. Beijing denies it censors content, saying it manages information. It has long had a key aim of controlling public opinion to keep the Communist Party in power. Companies that want to operate in China must accept that reality or pack up and leave. "Safeguarding the legal rights of foreign-invested businesses will not change," Xi said. "As long as China's laws are respected, we warmly welcome companies and entrepreneurs from all countries to invest in China." On social media, some postings that were quickly taken down by authorities mocked Beijing’s hosting the event, asking why such massive security had to be deployed to such a small town and questioning China's role as host. “The world is already connected by the Internet and here you are [a country] that madly takes down posts, blocks sites, wipes out anonymity and clings to your old ways, resisting modern political culture,” one post said. Qiao Mu, a professor at Beijing Foreign Studies University, said the idea of China hosting the conference is laughable, given its controls of the Internet and denial that it censors online content. “If China does not censor content, then why is it that in Wuzhen (during the conference) that Facebook and Twitter can be accessed, but not in other parts of China,” Qiao said. He also said that while the president has his views on the subject, he disagrees that there is such as thing as Internet sovereignty. Human rights group Amnesty International issued a statement calling on technology companies to reject what it calls Beijing's efforts "to influence global Internet governance in ways that would curb freedom of expression and exacerbate human rights abuses." “Under the guise of sovereignty and security," said Roseann Rife, Amnesty's East Asia research director, "the Chinese authorities are trying to rewrite the rules of the Internet so censorship and surveillance become the norm everywhere. This is an all-out assault on Internet freedoms." Analysts say China’s hosting of the conference, in a way, is an opportunity for it to market its controls to other countries and spread its point of view. Percy Alpha of GreatFire.org, a website that monitors blocked websites in China, said Xi is trying to remove the concept of the Internet completely. 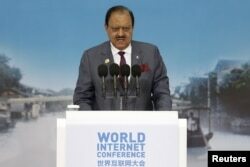 Pakistan's President Mamnoon Hussain speaks during the opening ceremony of the 2nd annual World Internet Conference in Wuzhen town of Jiaxing, Zhejiang province, China, Dec. 16, 2015. “If he succeeds, there will be no Internet. Rather, people in a certain region will only access domestic content controlled by the government. This is totally the opposite of the Internet,” Alpha said. Despite concerns, there is no denying the allure of China’s market. China has the world’s highest number of Internet users, and Wednesday Xi reiterated the country’s pledge for broadband coverage nationwide by 2020. Some Internet companies welcomed the hosting of the meeting and hoped it would give a boost to efforts to forward innovation. The question of whether China can continue to innovate and move itself further up the value chain even with such tight controls has long been a matter of debate. Hua Yeyu, executive vice president of Hangzhou-based Zheshang Investment Management Company, said he does not believe government restrictions have had an impact on innovation. Hua said gradual changes are preferred in a country such as China given its huge population. “Any reforms or changes, which are too drastic, will bring disasters to China as well as the world. That will also be bad news to the world. Take the condition in the Middle East as an example,” he said. Hua said he believes that as long as there is no change in direction, and there are no back steps or self-isolation, progress can be achieved little by little.